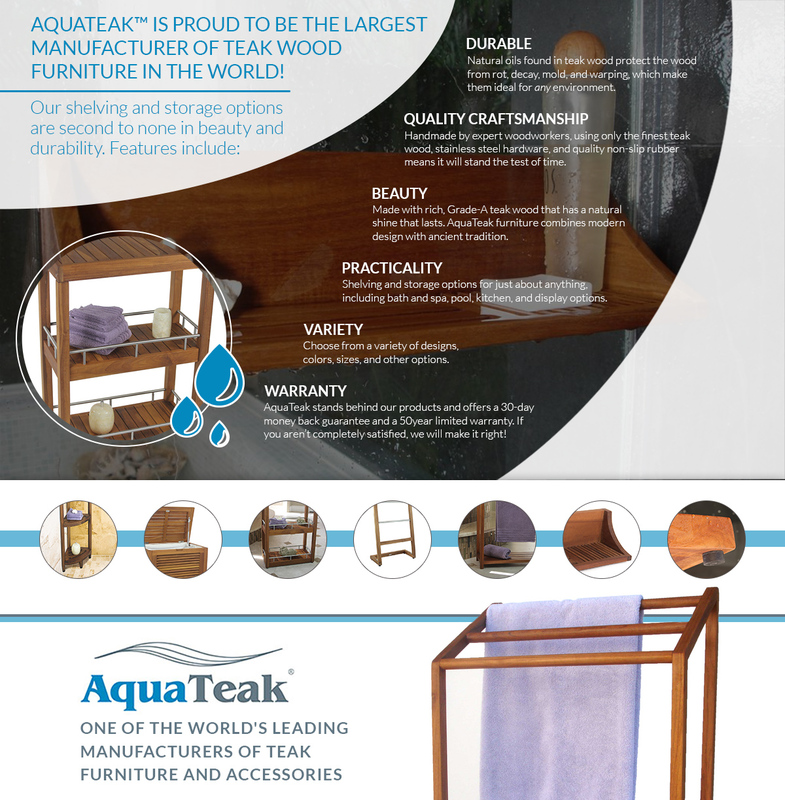 Organize any room in your home beautifully with teak shelves and storage products from AquaTeak™. Highly versatile and extremely durable, teak towel racks, hampers, and shelving bring the simplistic beauty of teak wood and promises years of functionality and enjoyment. Though perfect for moisture-prone areas, due to the natural water-resistant properties of teak wood, these shelving and storage solutions work perfect with any room's decor. The natural oils found in teak wood protect this beautiful wood from rot, decay, mold, and warping which make it ideal for any environment. Whether you want to hang your teak wood shelf in your bath or spa, on your deck, or in a hallway, it will last for decades regardless of where it is placed and what it is responsible for holding. Each piece of AquaTeak teak wood furniture is handmade by expert woodworkers to ensure quality and uniqueness of each piece. We use only the finest Grade-A teak wood in combination with stainless steel hardware and quality non-slip rubber, which means it will stand the test of time. All of AquaTeak’s shelving and storage pieces are made with rich, Grade-A teak wood that has a natural shine that lasts. AquaTeak’s furniture design combines a modern look with ancient tradition that honors the natural beauty of the wood. Although the rich color will lighten over the years, the brilliance and shine will last. If your teak wood furniture begins to look weathered or old, simply use teak oil to restore it to its like-new look instantly! Our shelving and storage options are great for just about anything including bath and spa, pool, kitchen, and display options. Our hampers are great for laundry or poolside storage and we offer a variety of shapes, sizes, and number of shelves to provide optimal functionality for any space. There is no one-size-fits-all option when it comes to storage. At AquaTeak, you can choose from a variety of designs, colors, sizes, and other options that make solving your organization and storage options easy! AquaTeak stands behind our products, confidently, and offers a 30-day money back guarantee and a 5-year limited warranty. If you aren’t completely satisfied, we will do everything we can to make it right. To own your very own teak word shelf or storage piece, browse our entire collection today!